I’m a self-admitted tech geek. I have no shame that I own lots of gadgets, software and anything digital like games, video, and of course, e-books. The more bells and whistles it has I’m like a kid at Christmas or my birthday. So imagine my reaction when Oceanhouse Media, Inc. forwarded an email announcing the release of the Dr. Seuss Bookshelf. According to the press release this is a the go-to app for Dr. Seuss books, games and cameras, available as a free download in the App Store℠. 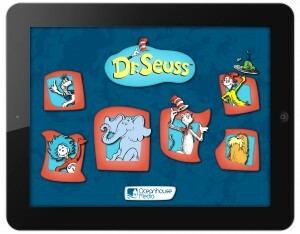 The first of its kind bookshelf lets users organize, launch and browse their favorite Dr. Seuss apps by Oceanhouse Media on their iPad®, iPhone® and iPod touch®. Well, now, this was all very impressive andI had to go and check this out for myself. Sure enough, parents and children can easily locate a title, select frequently used apps as favorites, instantly launch any Dr. Seuss app installed on their device and browse more than 45 Dr. Seuss apps in the App Store. To make it easier, they can sort by type, price or age, or use the search feature to find a specific app. In addition, the bookshelf app provides up-to-date information on new Dr. Seuss releases, sales and suggestions for holidays and special occasions. If you have kids, or maybe you’re still tickled pink by the silly but wonderfully, funny world of Dr. Seuss, head on over to the App Store. Remember, it’s just a click and pick away.